She’s looking for trouble. Well, here I am. Royal brat, meet royal hand of discipline. It takes a strong hand to be King. It takes discipline, and control. I may be rough around the edges, but as King, my rules will be followed, not challenged. …That all goes to hell when she barges into my world. Duchess Riley Noles - blonde, blued-eye, and five-foot-four of pure f*cking trouble. She’s wild, out of control and all sorts of challenging – a pretty little hurricane crashing right into me. And when I catch her red-handed screwing with my car, oh, there’s going to be hell to pay. But then, this tempting little firecracker may have just found exactly the trouble she’s been looking for. And when her soft moans tease through my ears, and her sweet curves press against my hard body, the last of my meticulous control might just be broken. She’s all sass and vinegar, but as King, I always get what I want. And with her, I’ll have it all – her body, her heart, and her sweet submission, over my knee and saying “yes please”. You know what they say about pretty little rich girls who look for trouble: they always find it. And Duchess Riley is about to find it with me. Hear ye, hear ye! A Queen-sized helping of insta-love, kindle-melting steam, and a filthy-talking alpha, all for you. Hang on to your crown, and buckle up - this is going to get ridiculous real fast. 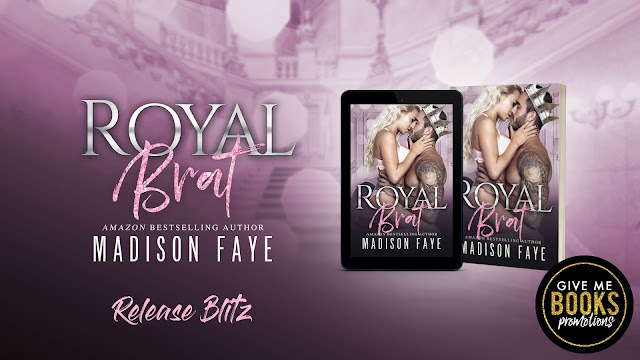 Ludicrously over the top, out of control, and pure dirty royal fantasy. As with all my books, this one is safe, with no cheating, and a HEA guaranteed.